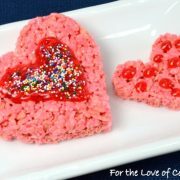 I wanted to make my kids an extra special after school snack to celebrate Valentines Day this year. 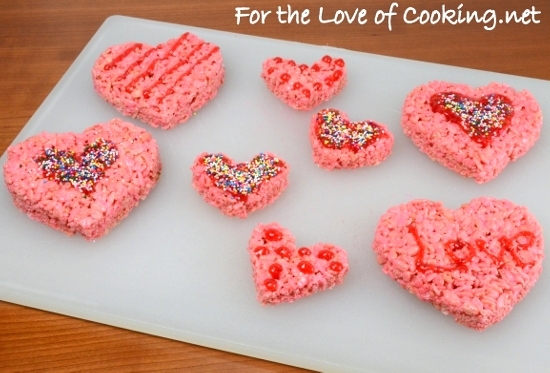 I decided to make them some rice crispy treats cut into heart shapes and decorated with gel frosting and sprinkles. Thankfully, my son didn’t mind that they were pink because they tasted so good. These fun and delicious treats took me less than an hour to make and put a HUGE smile on my kids’ faces. You can’t beat that! Place the butter in a large pot over medium heat. Add several drops of red food coloring and stir occasionally until the butter is completely melted. Add the mini marshmallows to the pot and cook, stirring constantly, until melted. Add more red food coloring until you reach your desired color. 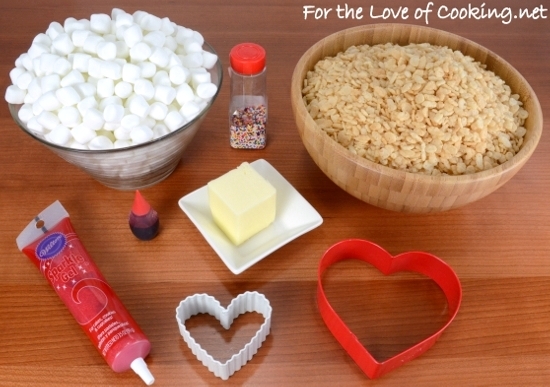 Once the marshmallows have completely melted, remove from the heat and add the rice krispies and stir until evenly coated with the melted marshmallows Coat a large 9 x 13 baking dish with cooking spray then pour the mixture into the baking dish. Spray a piece of wax paper with cooking spray, then use the paper to mash the rice krispie treats down into the dish evenly. Let it cool for 5 minutes before using cooking cutters to cut into heart shapes. Decorate with gel frosting and sprinkles. 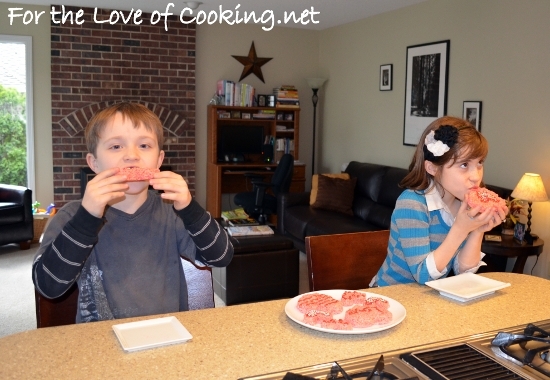 Serve to your special little Valentines’ and watch their faces light up. Enjoy! Always a winner! Look at how big those kids are getting!!! How cute and festive! And very fun to eat. Happy Valentine’s Day Pam! They look absolutely beautiful ! What a great treat for the kids! They look fantastic! Happy Valentine’s day to you and yours Pam! How cute! Your children are precious, Pam. Happy Valentine’s Day! Those are adorable hearts, Pam. I haven’t made rice krispy treats in years. They sound wonderful! Oh wow. Those look delicious! One of my guilty pleasures, rice krispie treats! I’ve loved them since I was a kid.. So easy to make! my kids would just love this, they’re so perfect for the season! Rice krispies treats just never stop being fun! These look awesome! Your kids are so lucky, these look adorable and delicious. Happy Valentine’s Day to you and your family! 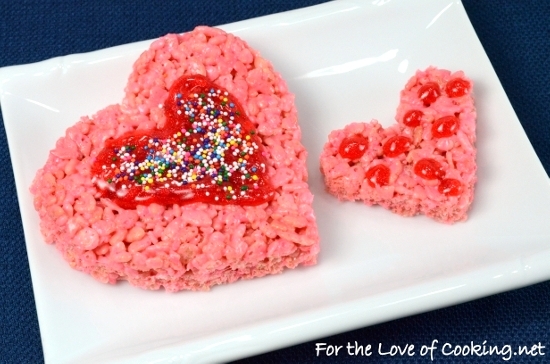 This is such a cute treat for Valentine’s Day. I hope you had a happy Valentine’s Day! Cool Vday treat, Pam. I can tell that your kids love it. 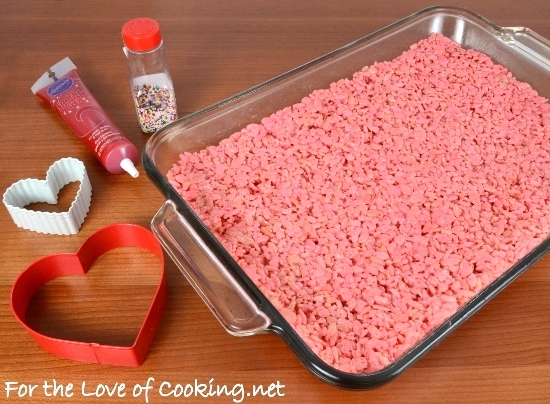 Wow, it has been FOREVER since we made rice krispy treats! Those things are addictive.